ROUND CAST IRON TRIVET FOR YOUR KITCHEN AND DINING Our cast iron trivets will add charm to you kitchen and dinner table while protecting your furniture and counters from hot food. Use this cast iron trivet to protect your tables and counters from hot food as well as a gift or decorative item. | eBay! CAST IRON ROUND TRIVET FOR YOUR KITCHEN OR DINING ROOM Protect your furniture and kitchen counter from hot dishes, pots and pans with our Cast Iron Vintage Trivets. Made from recycled materials, these cast iron trivets are an easy way to keep your surfaces clean and undamaged every time you cook or serve hot dishes to your loved ones. Our metal trivets come with rubber peg/legs to protect your furniture from accidental scratches. Use it with hot pots, tea pots, frying pens or any other cookware. DECORATIVE TRIVETS FOR YOUR HOME DÉCOR Hand-crafted with a rustic protective finish, these old fashioned trivets are decorated with antique-like, vintage ornaments to give your home a warm, sophisticated look. The vintage designs add a classy character, while the rustic finish reminds us of an old-country charm. This trivet for kitchen will also look great on your patio or living room and can be a purely decorative item under your flower pots etc. Use it as lodge trivet in your cabin. GREAT GIFT IDEA FOR ANYONE YOU CARE ABOUT A great gift is useful, has character and can last a lifetime. Our cast iron trivets can be used any day while bringing charm and character to a special home. They are durable, artisan and unique. These trivets will make a wonderful gift for a birthday, Christmas, wedding, house warming party, Mother's Day or just because you care. All our products sold on Amazon come with Amazon's A-to-Z Guarantee, our satisfaction guarantee and a 30 day return policy, so shop with confidence. Thank you. - &#128176 MONEY BACK GUARANTEE - We're so confident that you'll love our product, that we'll give your hard-earned money back if you're not thrilled with your purchase. Simply contact our friendly customer service team for a refund. All returns are on us - so there is zero risk to try the product today! - HIGH QUALITY, SOLID, and HEAVY DUTY PRODUCT - This decorative trivet is a solid piece, crafted with cast iron from recycled metal. It will last for generations. The metal trivet are covered with special coating, giving the item vintage or rusted look, while protecting the item from rust and wear. 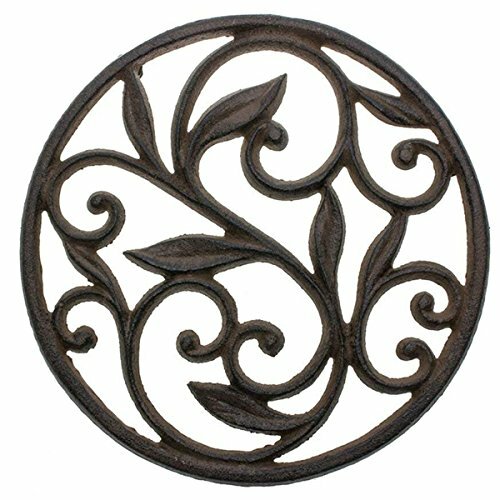 - ROUND CAST IRON TRIVET FOR YOUR KITCHEN AND DINING - Our cast iron trivets will add charm to you kitchen and dinner table while protecting your furniture and counters from hot food. Use this cast iron trivet to protect your tables and counters from hot food as well as a gift or decorative item. - CONVENIENT AND EASY TO USE - Attractive design of this item does not make it only a decorative piece. It is easy to use and will be a beautiful addition to any kitchen or dining room. This trivet comes with rubber feet/pegs for extra protection. This trivet measured 8X6".